The Church in contemporary Russia has become one of the country's most influential and effective social forces. It seems that no one can manage to have a constructive dialogue with the Russian government and remain independent, yet the Church manages to do just that. On the one hand, the Church can undoubtedly be called an ally of the state, largely because in the 1990s it promoted slogans that were then unpopular in political circles but which again became timely in 2000 and the years following. A vivid example is the story of how the Church interceded on behalf of Russia's main nuclear center in the city of Saratov, when there was talk of closing it down entirely and of the wholesale disappearance of the Russian atomic industry. 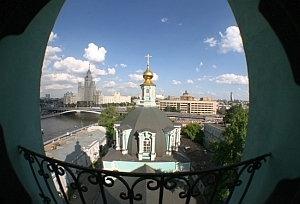 It is not surprising that today government leaders and officials come to the public prayers for atomic scientists held at Moscow's Cathedral of Christ the Savior; they say that the Church is their main ally in the patriotic education of youth, and have invited the Patriarch to speak to sailors on an aircraft carrier. But at the same time the Russian Church has refused on principle to impose its jurisdiction in Abkhazia and South Ossetia, recently recognized as independent states by Russia. The Church has made its position clear: that Russia has recognized these states as independent does not mean that they have ceased to be the canonical territory of the Georgian Orthodox Church. The discrepancy between state borders and the borders of Church Councils was and remains a typical peculiarity of world Orthodoxy. That is why the Russian Orthodox Church is not only Russia, but most of the post-Soviet states as well as Japan and China. The latter was confirmed yet again by the recent visit of Patriarch Kirill to Ukraine. His addresses were shown on Ukrainian television and watched by some 30% of the country's television audience, an absolute record. The Russian Church is also not shy of stating its position on many pressing questions today. Its expert council, Economics and Ethics, created this past summer, has already made two serious pronouncements: on the economic crisis and on the government plan for Russia's development through 2020. The gist is this: an appeal to devote more attention to social problems. The Russian government not only did not express displeasure at this meddling in its affairs, but let it be known that it had taken the Church's view into account. How does the Church manage to maintain such firm positions? Evidently, in part because, while participating in Russia's social and economic life, the Church remains outside the country's political life on principle, staunchly adhering to the positions it occupied during perestroika. The clergy's decision at that time not to participate in elections helped the Church avoid the sorts of internal contradictions that fractured almost all social institutions during the first post-Soviet years. Today, thanks to this neutrality, completely apolitical people, communists and enemies of the Soviet system worship side by side in Orthodox churches. Such different segments of society do not always get along, of course. In recent months church circles have seen two heated debates about highly odious figures in Russian history: Stalin and General Vlasov, who went over to Hitler's side during the Second World War. And although these debates became so tense that members of the religious hierarchy felt compelled to enter into them, this did not lead to any significant upheavals or divisions. Instead of a scandal, the result was an interesting discussion among historians, writers and journalists. In Russia today the Church has proved fairly immune to internal dissent. Moreover, while social and political structures throughout post-Soviet territory have collapsed over the last twenty years, the Church has been one of the few structures that has gained, rather than lost. Two years ago in Moscow, the Moscow Patriarchy was officially united with the Russian Church Abroad, created in emigration after the Bolsheviks came to power. The strengthening of Church positions is also a function of the change in the "average believer". Ten years ago the religious procession at Easter around any Moscow church automatically turned into a crush, something like Woodstock: huge masses of people of whom many were just curious while others were young and a bit drunk. Today there are fewer people, but when the regular parishioners begin singing The Symbol of Faith, almost everyone knows the words. The initial interest in the Church, which arose when the taboo on religious subjects was removed in the USSR, has gradually waned. But at the same time, quantity has finally become quality and the image of the old woman as the principal guardian of Orthodox traditions is slowly receding into the past, having given way to the young person with a college education - a successful member of the middle class. It is no longer a surprise to find people from the arts, politics, science and business on the pages of Orthodox publications, as it was even five years ago. Once a sort of decorative artifact, an incomprehensible symbol of a doomed freedom, the Church has become practically the most powerful social force in Russia. Will secular social institutions learn from the Church's example? That depends on them.